“I want to talk about my husband. He was just a normal guy, not a special career, but he loved to see righteousness in society, and this caused him to lose his life.” With her voice shaking, Nittaya Phachua, age 33, stood tensely beside a photograph of her deceased husband. Her husband, Inplaeng Tedwong, was an unarmed taxi driver from Ubon Ratchatani province who was shot in the chest during the Bangkok crackdown of April/May 2010. It has been nearly a year since her husband died, and Nittaya is still waiting for justice. 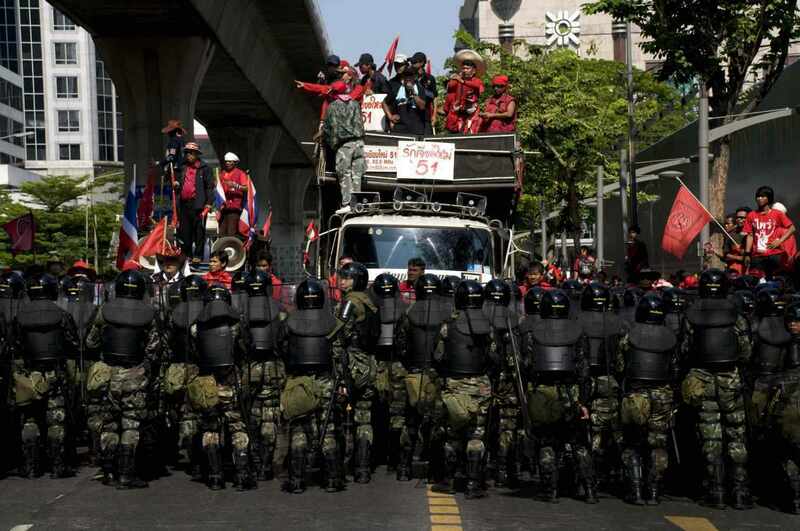 For those affected by the April/May 2010 crackdown, Thai history offers little reassurance that justice will be attained. After similar bloody crackdowns in 1976 and 1992, the truth was overshadowed by government issued amnesty. No perpetrators have ever stood trial. As the first anniversary of the 2010 crackdown approaches, how close is Thailand to uncovering the truth behind the 92 people killed and over 2,000 injured? Will victims like Nittaya ever be able to find reconciliation for the loss of their loved ones? In the past year, five groups have been involved in investigating the April/May crackdown of 2010. One report and one court submission have already been released. Another group has issued an interim report focusing on the roots of the conflict. Two more organizations hope to have reports out this year. One of those organizations, the National Human Rights Commission of Thailand (NHRC) intends to release a report in late June or July. Mr. Sophon Chingchit, Director of the National Human Rights Council of Thailand’s Office of Human Rights Protection, said in an interview that the delay in the report is due to the careful considerations of the report review committee that is scrutinizing the evidence in the report. As the NHRC report is waiting for approval, other reports are moving forward. Unlike the HRW report, the report from People’s Information Center (PIC), an organization consisting of academics, activists and students, focuses primarily on the human rights violations against Red Shirt victims. The PIC formed in July 2010, and expects to release their full report in December 2011 upon its completion. While the first three reports focus on finding the truth behind the violence, the Truth and Reconciliation Commission of Thailand (TRCT) focuses on reaching a common understanding. Commissioned by Prime Minister Abhisit after the crackdown as an autonomous body, the TRCT has until July 2012 to complete its mandate. According to the first Interim Report from April 2011, the commission seeks to determine the “root causes and precedents of the conflict and violence in the country.” Ultimately, the aim is to create a “culture of compromise and tolerance of different opinions” in order to achieve “long-term national reconciliation.” Recommendations for reconciliation include reaffirming love for the monarchy, compensating affected families, granting bail to detainees, and retracting arbitrary charges of lese majeste and terrorism. Critics question whether the TRCT is truly an autonomous and toothless body. Somchai Homla-or, chair of the fact-finding subcommittee of the TRCT, revealed that “we haven’t received cooperation from some factions of the military and the police. We don’t have much power, we give opinions and recommendations.” Beyond that, “we don’t have the power to subpoena,” Somchai concluded. While each report presents a different set of facts and views, all of the groups writing reports have faced a common challenge in their investigations. The government has severely limited access to important information offering evidence to parties responsible for the violence. The Department of Special Investigation (DSI) was assigned by the government to investigate the killings of last April/May. In December 2010 leaked documents from the DSI showed that from cases of 16 deaths, 13 of those deaths were “likely caused by soldiers” in the line of duty. The DSI later denied these findings. This lack of government accountability mirrors the aftermath of past political demonstrations such as Black May in 1992, when military units shot and killed at least 40 protesters. General Suchinda Kraprayoon granted amnesty to both the perpetrators and the victims of the violence. The government set up a fact-finding panel for the events, which released a report eight years later. Before the report was released to the Thai public, the names of military officials, units, and actions were blacked out or abridged. The recent announcement by Pheu Thai party to grant amnesty to all parties involved, contradicts the decision made by Red Shirts on May 10, 2010. Red Shirts rejected amnesty before it was offered putting themselves at risk of facing charges of terrorism and sedition, in the hopes that state officials be charged with the death of civilians. While the cycle of impunity may continue with the Pheu Thai party, a rejection of amnesty would be the first time in Thai history that a violent incident is not forgotten. The different reports attempt to recall the incident and move the country forward through efforts to be accountable to the Thai public. Dr. Sriprahpha recently stated, “If we compile the reports together, we may see the whole picture better.” This is perhaps the first time in Thai history when that is possible. While the future of amnesty in Thailand is unclear, “We cannot hold hands and forget like before. The problem will keep occurring, history will keep repeating itself” said Somchai Homla-or. Accountability is a cultural value, and its practice is greatly variant between societies. I would love to see an academic study that summarized the history, role, expression, and consequences of high vs low cultural value on accountability and correlations between those variables and trends in political structure and economic development. In Thailand, the monarchy (current form), a military without civilian oversight, a pay-for-play justice system, plaintiff-favorable libel laws, quasi-Buddhist karmic systems, and extreme economic disparity between classes all discourage the mindset of accountability. Democracy operates on accountability: fulfill your campaign promises or lose the next election. Without some kind of improvement to Thailand’s accountability culture (which could take a generation), one wonders whether elections really represent progress or just a rotation in who’s turn it is to get away with murder. I’m concerned, as a Bangkokian, that many people in my city are apathetic towards the 91 deaths last year. There’s not much outright public pressure for Abhisit to do much. I was at the Democrats’ rally 2 days ago and a Red Shirt shouted during Abhisit’s speech “What about the 91 deaths?” No one really cared to push this any further. Thai PBS interviewed Abhisit for the whole hour re: election and not a question on this issue. As the Thai education system neglects teaching the processes of reasoning and thinking, how can the majority of people be able to understand accountability let alone act on it. Thai politicians wont even fathom ‘debating’ as they claim it doesn’t belong in Thai politics. How convenient for them.. The Thai authorities, elites and those that back them have deliberately deprived the masses of the ability to think for themselves and when the masses have stood up as they have done periodically over the decades to this authoritarian stance they have been quickly subdued with violence. A voiceless people are an exploitable people. Those in economic control of the kingdom can shift the blame all they like but for decades they have manipulated the whole of Thai culture to elevate themselves into these illegitimate roles of supremacy. They rule with impunity as they have made the laws. Thai people have been brainwashed into thinking that these so called benevolent patrons will care for them, when in reality they are just treated as underpaid fodder for their monopolized businesses. That the Sino Thai are the most wealthiest and influential people in the kingdom is no secret. They have collaborated and networked with the Thai indigenous establishment as well as the security forces for decades to create the very instability that exists today. In conflict/ resolution situations the root cause must be identified in order to find a resolution. The root cause in this conflict is firmly based at the feet of those people who for nearly eighty years have claimed they want democracy for the kingdom but for decades have only wanted to maintain their feudal like control over the masses. Yes the diaspora s of Chinese who came into Thailand in the late nineteenth and early twentieth centuries were discriminated against but yet their tenacity for business saw a change in Thai laws which gave them citizenship. They have built the Thai economy to what it is today, yet they also took advantage of a society who for centuries worked under the ‘patronage’ system of subservience to ones masters. They with the indigenous elites became those MASTERS. It is the ‘clique’ like behavior of wealthy Chinese Thais and the Thai indigenous establishment backed by security forces, built up and perfected over decades that has not only brought enormous wealth to the kingdom but also enormous disparity. I may receive harsh criticism for my pointing the finger at particular cultural groups in Thailand and blaming them for the present situation. Yet Thailand’s issues with diaspora s conspiring with indigenous elites is not a lone case. Throughout Asia it has been well documented especially in Indonesia, Malaysia and recently the Solomon s how diaspora s of Chinese immigrants have conspired with indigenous elites to enrich themselves through nepotism and corruption. That they have been integral in building infrastructure especially financial infrastructure is true yet they are far from altruistic when it comes to spreading this wealth. That the military in these countries have protected the interests of these minority groups, themselves becoming extraordinarily wealthy is also well documented. You only have to do a search on the Thailand’s famous military leader Sarit to see how much this general accumulated while at the helm of the country. Thailand’s establishment have had their day, it is time to give the nation back to its rightful owners.. They are not royalty as they seem to assume themselves, hiding in their shadows, neither are they lords of a once feudal kingdom. The people of the Arab world have experienced similar autocratic regimes to what exists in many parts of Asia, regimes of oligarch families that protect themselves by paying off and collaborating with security forces to keep there centralized cliques in power. These people are not loyal to anyone but themselves, their families and their cronies who continue to perpetuate not only disparity in their host countries but corruption and suppression over the very people they need to maintain their illicit wealth. They need to be made ACCOUNTABLE and the human right of FREEDOM to choose ones destiny advocated ! Laws can only be enforced when there is no-one sitting above them. I don’t see any light of justice if a well-known root entity, untouchable by laws, is maintained in its current form.